A very high quality speaker cable made up from 168 strands of 0.12mm per conductor in a 24/7x0.12mm (2x 1.9mm squared) configuration, overall width 8.5mm. A very high quality Oxygen Free Copper speaker cable, ideal for use in home cinema and hi-fi systems as well as car audio systems. The speaker cable features a very flexible PVC jacket for easy installation. 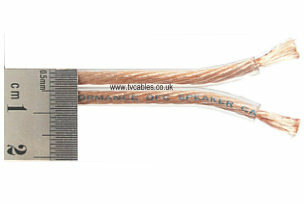 Speaker Cable 15m, 2 x 1.5mm OFC with transparent jacket Length 15m, supplied on plastic drum for easy unwinding. Multi-strand Oxygen Free Copper cable. Red stripe for polarity identification when wiring. Transparent jacket. 1.5mm squared copper cross section per conductor. Multi strand 189 x 0.1mm x 2, dimensions 6.5mm x 3.1mm.